Black Shuck are particularly common in the British Isles where it is also known as the Gyrtrash, Old Shock (in Suffolk), Old Shuck (in Norfolk), Shuck, Shucky dog. These phantom black dogs have terrorized England’s churchyards and crossroads for centuries. Its has size of a calf. Shaggy black dog with glowing eyes. Some eyewitnesses say it has only one eye. Usually appears before bad weather. Accompanied by the sound of chains, sometimes walks and growling behind people and then suddenly vanished. On November 1945 John Harries was followed by a Black Shuck as he cycled from East Dereham, Norfolk, to the Royal Air Force (RAF) station at Swanton Morley. Whenever he stopped, the dog would stop, and it kept pace with him even at 20 miles per hour. When he got to the base, it vanished. a dog that manifests in association with particular ancient festivals in various parts of the country. The Black Shuck's sightings is not just happening in the northern Europe, but also occurs in America. On January 14, 1971, a large, black dog received the blame when six hogs and three dogs were found slain, mutilated, and partially eaten at two farms a short distance east of Waterloo, Iowa. Then, just as suddenly as they had begun, the attacks of the Black Shuck ceased. After a month had gone by, the black large dog with the voracious appetite had ceased to sample any more plump Iowa livestock. Farmers in the Midwest often encounter unidentifiable footprints left by unknown animals that have mauled their livestock—then disappeared without a trace. A California man who prefers to be identified only as John claims three encounters with Black Shuck. Each incident occurred at a time when his life was in jeopardy. One night in late December of 2002, John and his girlfriend were sitting in the living room of his home in a town, which he noted, was built over a Chumash Native American burial ground. The couple was watching TV when suddenly they both felt a strong urge to look at the front window. Staring back at them was a black dog with red, glowing eyes. It stood at least five feet tall on all fours, and John noticed that although its muzzle was right next to the glass, the window did not fog. The dog’s appearance was “ethereal,” said John, yet he and his girlfriend both saw it clearly. John estimated that they gazed at it in shock for 15-20 seconds before he gathered his wits and jumped off the sofa to fling open the door. But there was no dog—or any other creature—in sight. A few days after the dog’s appearance, John was almost killed in a car crash that wrecked his 1987 Caprice Classic station wagon. But it would take two other incidents before John began to connect the dog with dire moments in his life. The next year, in 2003, John was put on a pain medication for a chronic medical condition. He suffered an adverse reaction to the drug, and was rushed to the emergency room by ambulance. On the way, he happened to look out the vehicle’s rear window and was stunned to see the same black dog staring at him with those glowing red eyes! As it turned out, he nearly died before doctors were able to treat the reaction. 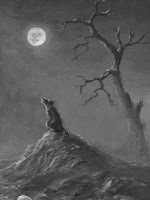 Incredibly, the Black Shuck would make one more appearance. In 2004 John suffered yet another life-threatening reaction to medication for the same ailment, and this time, he was pronounced clinically dead for over two minutes. The last thing he saw before his heart stopped was the huge black hound, standing next to his hospital bed, its red eyes boring into John’s as he lost consciousness. John was never sure whether the creature’s visits were intended to usher him into the next life, to warn him of danger, or if the dog simply came to observe like some type of spiritual vulture. In any case, he hopes never to see it again.